Long Island City (abbreviated LIC) is in the NYC Borough of Queens. 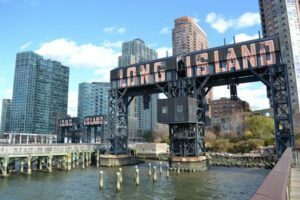 On the East River at LIC’s western edge is the famous gantry sign proclaiming LONG ISLAND. Queens and Brooklyn are part of the island called Long Island. Long Island City is not IN Long Island or even ON Long Island. Long Island isn’t even an island. New York City consists of the 5 Boros of Manhattan, Brooklyn, Queens, Staten Island, and The Bronx. Each borough or boro (not burrow) is also a New York State county. Logically The Bronx is Bronx county. Queens is Queens County. Manhattan is New York County. Brooklyn is Kings County and Staten Island is Richmond County. All the counties’ various neighborhoods are officially the name of the county, except for Queens which has town names. No one actually knows where these are located, except for Astoria and maybe LIC. (No one calls them towns. They are just “parts” of Queens). The Bronx is always The Bronx, but the city is just Manhattan. If you have been pronouncing LIC as ”lick” this whole time, you are as bridge and tunnel as anyone outside the city. It’s “El eye Sea”. Hope that clears everything up.